Located in the heart of the historic Gaslamp quarter, this hotel features a rooftop terrace and complimentary breakfast. This Victorian style hotel in the Gaslamp Quarter offers uniquely designed rooms, and has an onsite restaurant and bar. Formerly the Park Manor Suites,this historic Italian renaissance style all suite hotel has an onsite restaurant and bar. Located in San Diego's North Country, the hotel has an outdoor pool and hot tub, 24 hours fitness room, and restaurant. This small boutique hotel is geared towards energetic budget minded adults who enjoy the social scene. The hotel offers a day spa, salon, fitness center, swimming pool, and several restaurants. Formerly the Woodfin Suite Hotel, this all suite hotel was purchased by Hyatt in May 2011. This hotel features an on-site restaurant, function space, a fitness center and is located near many local attractions. Located on 12 beautiful acres in Mission Valley, this hotel offers close proximity to Sea World and the San Diego Zoo. 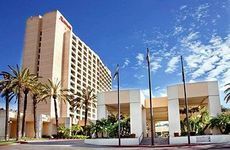 A centrally-located hotel close to San Diego attractions and minutes from downtown featuring a spa and outdoor pool. Located on 44 acres on Mission Bay, this resort offers waterfront dining and a full service spa. This hotel features the Islands Sushi & Pupu Bar and an outdoor pool and waterfall. Across from Seaport Village, this all suite hotel offers a complimentary cooked to order breakfast. Minutes from the La Jolla beaches, this hotel offers a complimentary breakfast with a "make your own omelet" bar. This downtown hotel offers complimentary airport shuttles and private balconies overlooking the harbor and city skyline.